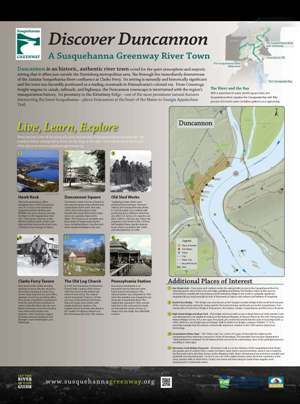 Duncannon is an historic, authentic river town noted for the quiet atmosphere and majestic setting that offers just outside the Harrisburg metropolitan area. The Borough lies immediately downstream of the Juniatta-Susquehanna River confluence at Clarks Ferry. Its setting is naturally and historically significant and the town was favorably positioned as a trading crossroads in Pennsylvania's colonial era. From Conestoga freight wagons to canals, railroads, and highways, the Duncannon townscape is intertwined with the region's tranportation history. Its proximity to the Kittatinny Ridge- one of the most prominent natural features intersecting the lower Susquehanna- places Duncannon at the heart of the Maine to Georgia Appalachian Trail. This rocky promontory offers sweeping views of the Duncannon area. It's a stop on the Audobon's Susquehanna River Birding and Wildlife Trail, and a famous rest stop for hikers on the Appalachian Trail. Duncannon is known as the effective halfway point of the 2,180 mile trail that traverses the East Coast of America from Georgia to Maine. The historic center of town is found at Duncannon Square where Market and Cumberland Street meet. This early 1900's view of the Square looks towards the Doyle Hotel which today serves as a popular stopover for hikers. The Square is an excellent area from which to begin exploring the town, including historic churches and other notable buildings in the area. "Lightning Guider Sleds" were produced here between 1904 and 1988 by the Standard Novelty Works. In 1920 the plant was credited with producing more children's sleds than any other U.S. factory; its capacity was then 1,600 to 1,800 per day. Today, the property is also home to the 110-foot tall Forest Fire Lookout Tower which was built in the 1940's and relocated here in 1998. Now home to the oldest standing structure in town, this site served as the western landing of Clarks Ferry, tavern, stage stop and inn, post office, and later as Civil War recruiting office. Ferry boats crossed the Susquehanna from the end of Peters Mountain to where Clarks Run flows into the river. Native Americans once had a fording here, followed by traders and pioneers with Conestoga wagons traveling westward along the first through-road to Huntingdon and Pittsburgh. uence in the area during the early 19th century. Duncannon developed as an important hub for land and water based travel and transport. This railroad station was completed in 1902 when the mainline was changed to run along the Susquehanna River. The original line, opened in 1849, was the main line to the west and two tracks ran through the center of town on what is now the Apple Tree AlleyWalk corridor.